Books continue to inform my intellect. I have to have the physical presence of a book in my hands. No Kindle reading for me. My literary habit usually involves reading two to six books a month. Reading is also a meditative process for me. Reading a good book dissolves the stress of the everyday world for a few precious moments and is a healthy and healing escape for me. I have counted many writers, known and unknown, as friends and it always thrills me to read a poem, article or book by a friend. I understand the struggle of the process and I support the success of the work’s completion. First let me provide a bit of background regarding my friendship with, as I call him, Dr. Dave. Dr. Dave Janda graduated from Bucknell University and earned his medical degree from Northwestern University Medical School and completed his orthopedic surgery residency at the University of Michigan. He is a practicing orthopedic surgeon and shoulder specialist at the Michigan Orthopedic Center as well as the Director of the Institute for Preventive Sports Medicine in Ann Arbor, Michigan. Dr. Dave Janda is also the host of the conservative radio program, Operation Freedom, on WAAM talk radio in Ann Arbor. Dr. Dave has been vocal on his program about the need for finding some real accountability about the Benghazi attacks. As my wife and I lost our nephew, Sean Smith, in the first Benghazi attack on September 11, 2012, which also took the life of Ambassador Chris Stevens, our friend Mary felt that we would find a common bond with Dave. She was absolutely correct. I have found Dr. Dave Janda to be a warm, well informed and passionate patriot. I first appeared on his show, Operation Freedom, on February 28, 2016. Since then I have appeared as his guest 10 more times. Out of the dozens of interviewers I have been interviewed by in the past few years, Dave Janda is my favorite. I was greatly impressed and pleased when I received a copy of Dr. Dave’s book. But more importantly, I was impressed with the depth and scope of Dr. Dave’s story. 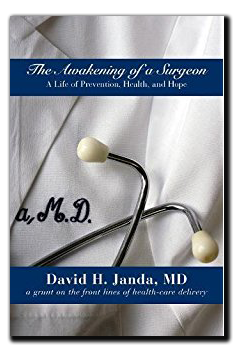 “The Awakening of a Surgeon,” opens with a profoundly spiritual moment in Dr. Janda’s life. In July 1989, he was facing the completion of his medical boards, the culmination of his training. Gravely, at the same time his daughter Allison was seriously ill. Because of an abnormal white blood count, it was thought she might have leukemia. To top it all off, Dave Janda was run down and ill with the flu. While sitting beside his daughter’s bedside in the hospital, Janda had a “Field of Dreams” moment. He heard a voice in his head stating the following, “Don’t stop your research. Establish an institute. Focus on prevention.” Startled, he bowed his head and advised God that he would not stop his research, he would establish an institute and would focus on prevention if God would heal Allison. Literally, minutes later, his daughter woke up from a coma-like state to her normal sparkling self. It turned out Allison had a viral suppression of her bone marrow. During one of his 24 hours shifts in the emergency room he decided that he would start to keep track of the type of injuries that came through the emergency room doors. To his surprise, half of the folks that came in were suffering from sports injuries, in particular, softball injuries. Upon further investigation, Dr. Janda determined that the majority of the softball injuries occurred when the player slid into the base. While in residency, with the assistance of Dr. Fred Hankin, Dr. Janda decided to put his findings in writing. He submitted a study to the American Journal of Family Physicians. This lead to a lifelong passion for preventative sports medicine. On the path of his research he determined that properly tested safety equipment such as breakaway bases, chest protectors and safer baseballs could greater reduce injuries, and in the case of chest impact injuries from thrown baseballs, possibly prevent death. Dr. Janda has also studied and made recommendations in regards to soccer injuries. As detailed in his book, the story of Dr. Dave Janda is a broad based journey. I think anyone interested in preventative medicine should read Dr. Janda’s book. Sometimes as human beings we must address incompetence, negligence, and criminal behavior with a necessary form of activism. Activism is not always waving fists or signs. Activism can be a careful study of what is wrong and who is responsible for a social issue or, in this case, a medical issue. The journey described in “The Awakening of a Surgeon,” lead to Dr. Janda to fight sporting equipment manufacturers, to testify before Congress, to speak before the medical community in this country and other countries and to eventually establish The Institute for Preventative Sports Medicine in Ann Arbor, Michigan. Sometimes speaking out is not enough in this life. As Dr. Dave Janda has demonstrated sometimes one must step up. I find that the true basic measure of a human being is how they respond to adversity. In an even broader sense, how we respond and address the injustices in this life broadens our place in humanity and strengthens our conscience. We must practice a form of necessary activism at times in order to face ourselves in the mirror in the morning. We need to walk in the path of angels while avoiding the greed and avarice that can darken our humanity. Dr. David H. Janda successfully continues to effectively span the spaces between the practice of medicine and the prevention of injury. As a physician and as a patriot on the airwaves, Dr. Janda continues to inspire thinking Americans with his story.